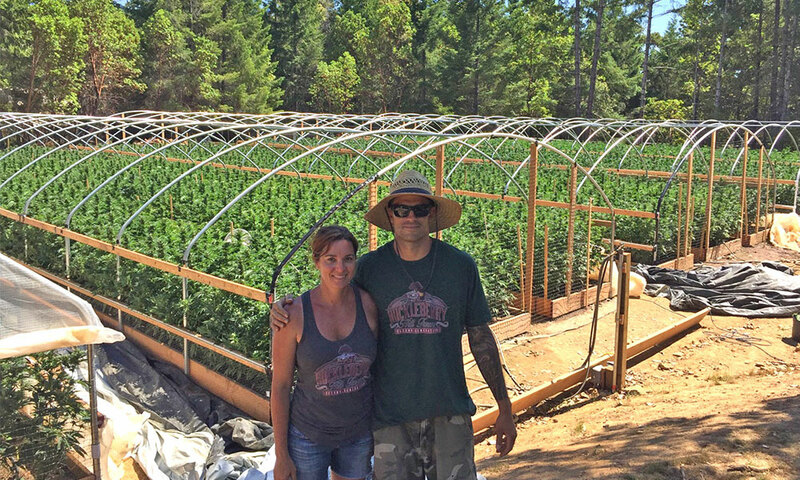 Jason Gellman is a second generation Southern Humboldt cannabis farmer, hailing from lands known to produce some of the finest outdoor cannabis on the planet. He says the lands are a part of his blood and his way of life, which is why he says he hopes the culture of the hills will survive through this tumultuous period in California cannabis. Gellman, who is the founder of Ridgeline Farms, recently took home that culture’s biggest prize. In December 2018, the farm won first prize in the full sun category of The Emerald Cup for their strain Green Lantern. For those uninitiated, the Emerald Cup is essentially the world championship of outdoor-grown pot — and winning in 2018 was a huge deal, since it was the first competition since California’s adult-use market officially opened on Jan. 1, 2018. Following the Emerald Cup, on March 28, a limited line of Ridgeline Farms’ Green Lantern is now available (while supplies last) for purchase in a few select California dispensaries, through a partnership with Flow Kana. Like many other growers, Gellman spent years working under the guidelines of California’s medical marijuana law, Proposition 215, as well as the guidelines that then-Attorney General Jerry Brown provided the California cannabis industry in 2008. But a new era began following the passage of Proposition 64 in 2016, which legalized adult-use cannabis in California and ushered in the brand new world of permitting. While the challenges of regulation proved too much for some, Ridgeline has survived so far. But Gellman admitted that it’s been an uphill battle. Gellman said at times it has been very difficult to come out from behind the curtain of the past. The first challenge was becoming a business, as Ridgeline Farms is a family-run and owned operation without the backing of any mega-investors. Gellman is still jumping through the hoops that followed in getting his permits with the county. He said he had to downsize from two properties due to the challenges he faced with regulations. Prior to the Emerald Cup, Gellman said he wasn’t sure what he was going to do about staying in the cannabis industry or not. Farmers were finding various methods to get their legal product to the world, be it organizing amongst themselves or signing on with large distributors who have made their way through the hills. But even then, their cannabis wasn’t really getting out there. A field of Green Lantern grows at Ridgeline Farms. He noted that the kind of soil used to produce champions takes a lot of love — i.e., time and money — just like the plants do. After winning the Emerald Cup, Gellman was finally pushing his product out to the masses. Gellman first got his hands on the Green Lantern strain from a good friend. He says back in the day there were barely any strains, and Green Lantern was one of the few on offer. “Not like nowadays where there are a million different crosses, there was just a couple,” he said. Gellman and all his buddy’s parents were growing seeded weed. Gellman’s pal had some OG seeds from many years ago and was always doing crosses. On one of the pairings, he got a lone seed in a bag of some high-end full sun cannabis. He paired the OG-heavy strain with something a bit fruitier, eventually finding single bag seed. After more seeds were produced, Gellman weeded out his winning phenotype from between 50 and 100 plants. It was the combination of fruit and gas he was looking for. “We stuck with that one and we’ve been growing it a while. Now I know people like it,” Gellman said. The Green Lantern has topped off at over 30 percent THC. Gellman is proud of the hype being driven by Green Lantern, despite its old school roots. Gellman admits the next generation of Green Lantern genetics he’s working on will have some lab work involved, as he hopes to get the genetics out to an even wider audience. He says what people notice about the strain — if they’re lucky to get some, because there isn’t that much out there — is it’s not a pungent smelling strain to grow. However, when you grow it to perfection and dry it to perfection, it smells great. The batch that won the Emerald Cup was a random 20 plants they threw in late and let go the full light cycle and it came out amazing. As for the future, Gellman said “we’re staying small.” Despite a flurry of folks that would love to financially back an Emerald Cup champion looking to scale up their operation, Gellman said he’s not interested. “I’ve been growing for my whole life, and so I’m kind of burnt out a little bit,” he said. Gellman said he wants to focus on doing the best he can at a smaller scale. Gellman spoke of looking up at the ridgeline of King’s Peak, the namesake for the farm. “I just love my home. I love Southern Humboldt. I love this way of life. It’s a really great community — and 99 percent of the people grow weed, even if they say they don’t,” he said. He also hopes the recognition he is receiving at the moment is passed on to the Garberville community that been such a major part of cannabis in America for decades with little to no props given. “Everyone knows the Humboldt name, but we’re starting to get pushed out,” Gellman said. While Humboldt has the perfect climate to grow cannabis, it’s hard to compete with the acres on acres of fields or greenhouses in places like the Central Valley or Salinas. “More than anything, I just really want people to know this recognition I’m getting, is because Southern Humboldt grows some of the best weed. I have so many friends and family members, you can’t beat it,” Gellman said.